I'm excited to share the news that Diane Heiman and Liz Suneby have paired up for another wonderful book, It's a It's a It's a Mitzvah (Jewish Lights). After their collaboration on The Mitzvah Project Book, the two wanted to share the same theme of helping others with a younger audience. In It’s a It’s a It’s a Mitzvah, (their first picture book), they invite children to take a journey with the Mitzvah Meerkat and pals as they do good deeds and mitzvot grounded in Jewish tradition. Many people are curious as to why they chose a meerkat as the character who explains each act of kindness. Well, Diane's own daughters were huge fans of Animal Planet’s documentary television show, “Meerkat Manor.” Liz and Diane liked the alliteration of meerkat with mitzvah. They also thought that a meerkat would be an appealing “fresh face” in children’s book, and it already had the thumbs up from Diane's kids! Their first collaboration with an illustrator couldn't have been more productive. 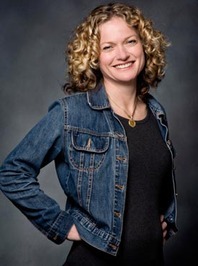 Diane says "Laurel Molk’s captivating illustrations create architecture for the book filled with soul and humor. She added so much to the book’s development. Laurel suggested adding the trio of mice in each spread, which contributes an additional layer of whimsical fun to the more serious sentiment of caring for others. It amazes me that Laurel’s close friendship with Liz predates Liz’s and my writing careers. Naturally, we urged Jewish Lights to consider Laurel as the illustrator. To me, that’s a great definition of 'bashert'!" It's a It's a It's a Mitzvah! was recently selected as one of the "50 Best Spiritual Books of the Year" by the multi-faith web site SpiritualityandPractice.com. 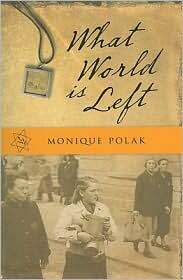 ﻿What World is Left (Orca, 2008) by Monique Polak tells the story of Anneke and her family as they are forced from their comfortable home and taken to Theresienstadt concentration camp, the site of a Nazi propaganda film. In the camp, Anneke and her family face disease and despair, as they struggle to do what is right. The novel is inspired by Monique Polak's mother, whose family spent two years in Theresienstadt. Perhaps this real life connection is why Anneke feels so real, a relatable teen whose dreams and desires manage to exist in the darkest of times. I read What World is Left and was pulled into another world. My heart ached for Anneke, but her spirit inspired me. Last year, I had the opportunity to meet Monique at the Association of Jewish Libraries Convention in Montreal. Since I had loved What World is Left, I was excited to see Monique's presentation. What an experience! Monique is charming, passionate, and dynamic. It was as if Anneke had come to share her story – an absolute highlight of the convention. I’m delighted to welcome Monique to my blog! I know you’ll love her, too. What World is Left is based on your mother’s experiences. How did you balance your family history with the fictional aspect of the story? My mother is now 83. When I interviewed her for the project about five years ago, she already had difficulty remembering specific facts. That is one of the reasons I decided to fictionalize her experience. The other reason is that my mum insisted she had never -- not for a second -- questioned her father's actions. To clarify, her father (my grandfather) Jo Spier was a well known Dutch artist. When the Nazis found out who he was, they forced him to produce propaganda art. What interested me most was writing about a girl who questioned her father's actions. Even my decision to fictionalize this part of the story was difficult for my mother (and also for her brothers). But I felt this was an issue that would make the book resonate with contemporary readers. I think it's the central question in the book. What would readers do if they were faced with a similar situation? How far would any of us go to keep our families alive? My narrator Anneke is kind of a mix of my mother and me. I began by trying to imagine myself in my mum's position. Writing this book helped me understand a little better a part of her life that she'd always kept secret. Can you share your research process for writing What World is Left? I spent years researching what happened at Theresienstadt, the concentration camp where my mum was imprisoned. I read everything I could about the camp. Then, and it took a great deal of convincing, I got my mother to agree to be interviewed. I worked with her for about three months in 2007, every weekday morning. She called our sessions together, "Dutch lessons." She never said they were about the Holocaust or even the war. My mum had kept her story secret for more than 60 years! It's also remarkable I think that she told the story without an ounce of self-pity. She only cried once or twice, always for other people. What did you learn about the artists whose talents were exploited by the Nazis? I learned that these artists were put in a terrible position -- one that must have been very painful. I realize that the rest of us, or at least most of us, are blessed never to have to face such moral quandaries. I also know that some of these artists, including my grandfather, also produced "true" drawings of what they saw in Theresienstadt. If these drawings had been discovered, my grandfather would almost certainly have been killed. Another thing I'd like to point out is that my grandfather must have realized that his talent kept him and his family alive. I was very close with my grandfather, who lived in New York when I was growing up. But he died before we could discuss any of these things together. As a reader, the aspect of the story that took my breath away was that young love manages to grow in the bleakest of times. What has been the response from teen readers? The scenes with Franticek were the ones I most enjoyed writing. My mother really did have a small crush on a boy in the camp. He was older than her, and my mother thinks he was having a sexual relationship with an older woman in the camp. My mother never knew what became of this boy. Only when I was researching the book did I learn that he had been transported to Auschwitz where he died in the gas chambers. When I was writing the book, I felt like I was falling in love with Franticek, too! My teen readers seem to respond to the romance in the story. But mostly, I find that they are interested in survival. Many teens I meet are themselves going through difficult times, and I think it's good for them to know that though their lives can be blown apart, they can rebuild them. The scars make us who we are. During school visits, I always tell students my mum is a force of nature. She is funny and smart and full of life. She stands up for what she believes in. And yet, she lived through hell. It's an important message for all of us. We can get through terrible things, too, and come out changed, but not destoyed. You recently traveling to Holland for a release of the Dutch translation of What World is Left. Can you tell me about your visit? It was the trip of a lifetime! I went there with both of my parents and we launched the book twice. The first time was at the Jewish Historical Museum. It's connected to a former Jewish opera house, from which my mum and her family were deported. She had never returned there since April 1943. Neither of my parents cried there, but I did. In some ways, I feel like I am not only sharing my mum's story, but also helping her process all the emotions connected with what she endured. The second launch was in a museum in the town of Zutphen, my grandfather's hometown, where his work is on permanent display. I met so many interesting people, several of whom shared their own memories about my grandfather. And you know what? I could write another book based on the stories they told me! I understand you have been taking boxing lessons? A new project in the works? Yes m'am! I've been taking private boxing lessons for nearly a year now. It's partly for fitness, but mostly for research. I'm completing the first draft of a manuscript tentatively entitled Straight Punch. It's already scheduled for release in spring 2014 with Orca Books. And I have two new books coming out before then: Pyro (fall 2012) and So Much It Hurts (fall 2013). Both titles will also be published by Orca. Hanukkah! I think because though I'm 52, I'm a kid at heart and I love getting presents! Also because I love candles and lights. I believe that even in darkness, we must find the light. Thanks for asking all these questions. It's always a pleasure for me to talk about a project which is so close to my heart! Big hug to you and your blog readers from Monique!